Instruction in the basic techniques of traditional Japanese embroidery is an orderly progression of phases that should be taken in sequence. While there are about fifty basic techniques, some phases cover a number of procedures, and others focus on only one. 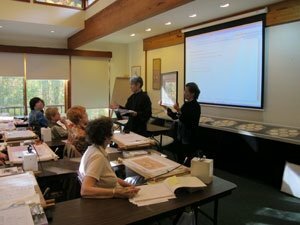 Instruction in technique goes hand-in-hand with an introduction to the symbolism and color usage that form part of the tradition of traditional Japanese embroidery. The following list will give you basic information about the material covered at each level. Instructors who have studied these techniques and are now teaching in the Kurenai-Kai tradition, have some leeway in the selection of the pieces they will use to make up their own curriculum, but the overall accomplishment remains the same. 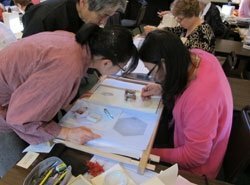 Open Classroom Sessions are held multiple times a year at the Japanese Embroidery Center for students at all levels who have previously studied traditional Japanese embroidery. Students may bring work in progress to receive help as needed, or they may select a project geared to their skill level under the direction of the teacher.